These games are set on Benus Majoris with the basic premise being that the Death Guard Plague Surgeon is collecting geneseed and where better to harvest it than from a Deathwatch force with a diverse array of chapters represented. I’ve played vanilla Primaris in Kill Team before and they are somewhat lacking against many opponents, with their lacklustre guns and poor melee options. The Deathwatch’s Special Issue Ammunition help with the former and I typically choose the 2+ to wound option on the bolt Rifles (as it they have -1 AP). Add in a Frag Cannon and an Infernus Heavy Bolter and things aren’t looking too bad at range. In close, things aren’t quite as favourable. I have a Captain, with the Strength specialism, armed with a Power Sword. S5 and -3 AP isn’t too bad, but 1 damage isn’t great. In the first game (Hold the Line) we scored equal points, but I forgot to take a Break Test in the final round, and of course I rolled a 10! My shooting was effective, but I was only scoring flesh wounds, even with CP rerolls. The close combat oriented Plague Marines slammed into me. My Captain managed to best the Plague Surgeon, but my losses stacked up. The second game (Comms Down) saw a reversal of fortune. Dan pushed aggressively to try to hold the centre with the Plague Surgeon, but I was able to concentrate too much fire on him and he fell in the first round. This mean’t Dan’s only path to victory was to try to break me again, but my wall of fire was more effective this game and he wasn’t able to get close enough with his melee hitters. 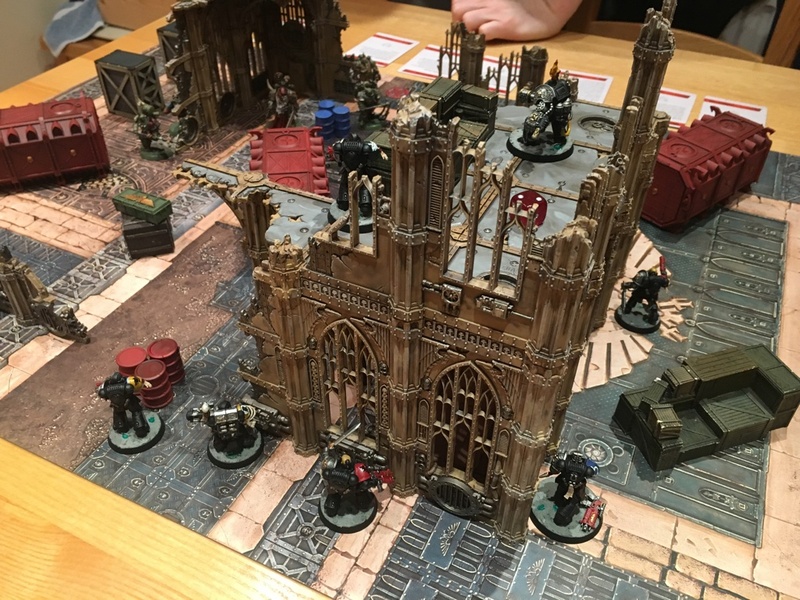 A good start to using these new factions and certainly seem to be offering more of a game than the Patriarch led Genestealer Cults versus the Brotherhood Champion led Grey Knights did. Those commanders were exceptionally powerful in melee, but it meant the games came down to which one of us won that Commander duel. Hopefully the Plague Surgeon and Primaris Captain aren’t so impactful.